Located on the “World’s Most Beautiful Beaches.” With shimmering white sands and cool emerald waters, this is the perfect destination for your next vacation. Our 1,388 square-foot two bedroom and 1,800 square-foot three bedroom oceanfront units feature an open floor plan and a large fully equipped kitchen with granite counter tops. Enjoy breathtaking views from the spacious balconies where you can enjoy spectacular sunsets and watch dolphins swim. We have it all! Accommodations include a master bedroom with a king bed and a private bathroom with a double vanity, tub and shower with glass enclosure and a walk in closet. Guest bedroom with queen bed, built in twin bunk beds and a sleeper sofa in the living area. Our three bedrooms include all this plus a second guest bedroom. The full size guest bathroom also features a tub and shower with glass enclosure. 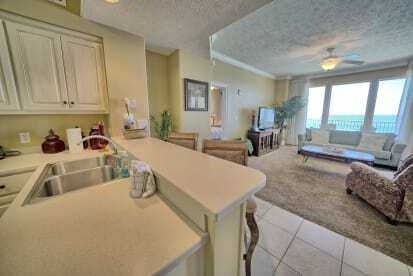 Also included are ceiling fans, a washer/dryer for your exclusive use, cable TV with HBO and High Speed Internet.